Cusco, nestled in the altiplano (high plain), is deservedly known as the jewel of the Andes. A thorough exploration of its streets, history and the quality time the nearby Sacred Valley-with its vibrant culture and living traditions prepare us for the Sacred Inca City of Machu Picchu, the renowned UNESCO World Heritage site and the most iconic example of the Inca legacy. The great Inca civilization remains a mystery to modern science despite extensive and magnificent ruins punctuating the cities, mountains and valleys in and around Cusco and the Urubamba Valley. We imagine life a thousand years ago, beginning our quest to understand the Incas. From Cusco, we continue on to our small Andean base, from which we will walk the fertile Urubamba valley, the center of Inca civilization. In Pisac, women’s skirts brim with white, yellow, orange, red and blue potatoes on market day. We descend through ancient agricultural terracing and geometric edifices to the market, clustered around a whitewashed adobe church. Here craftspeople hawk wool rugs, alpaca sweaters, silver jewelry, colonial artifacts and produce. We travel by foot and train to the Sacred Inca City of Machu Picchu, the renowned UNESCO World Heritage site and the most iconic example of the Inca legacy. Our expert guide leads us through Machu Picchu’s magnificent structures before returning by train to Cusco in time to explore the local markets and traditional medicine museum. Pre Tour: Arrive Lima Suggested Overnight: Lima Airport hotel based upon arrival time. We suggest spending an extra day in Lima should you have the opportunity. Lima has become one of the top “foodie” destinations in the world. We meet mid-morning flights arriving from Lima and transfer to our chosen hotel before we set out to explore the city. This afternoon we visit Cusco’s main attractions. We start with the Santo Domingo Monastery, the legendary Korikancha (Temple of Gold – the most important Inca temple devoted to worshipping the Sun), the walls of which used to be plated with sheets of gold. We continue to the Cathedral at the Plaza de Armas, and the Plaza de Regocijo, as well as the old town with its remarkable Inca walls. We continue on to the San Blas quarter with a walk through this quaint district with one of the finest views of the city. This quarter is home to the workshops and stores of the most renowned craftsmen in Cusco, including Mendivil, Merida, Rojas and Palomino. You will visit its beautiful colonial church, which houses an impressive wood-carved pulpit. We’ll return to the hotel to enjoy the night in Cusco, with its varied and delicious restaurants, and special vibe around the city’s colonial center. Potential Highlights based on time: Sacsayhuaman archaeological site, Pisac ruins, learn about textiles and the weaving process from the Amaru community. Early in the morning we are driven to the Sacred Valley, visiting the archaeological site of Sacsayhuaman on the way. We continue to the nearby town of Pisac and drive up the road to the Pisaq archaeological complex. The site is perched high on the mountaintop overlooking the picturesque Andean village of modern Pisaq. 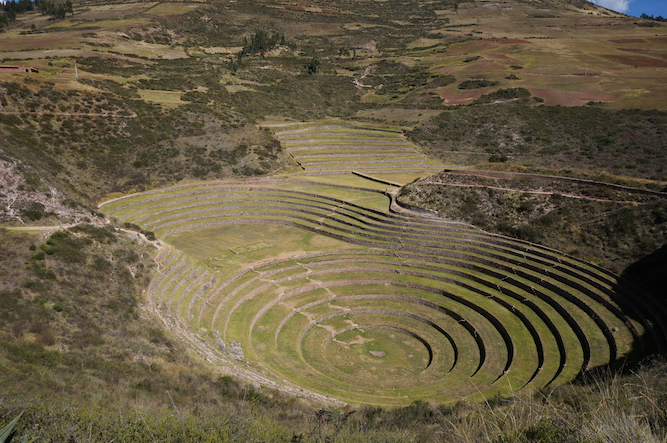 This Inca archaeological complex includes some of the finest Inca stonework, besides that seen in Machu Picchu, as well as extensive royal buildings, look-outs, terraces that rise 600m/2,000 feet above the river below, tunnels and irrigation channels. After exploring the ancient complex, we continue our immersion into the heart of Andean culture through our visit to the charming Amaru community. Straight from the hands of local craftspeople, we learn about textiles and the weaving process. The vivid colors of the Amaru villagers’ clothing are derived from natural dyes made from plants and other organic elements with which they decorate wool. Today we learn about ‘cochineal’ red and the secret properties of other medicinal plants in the area, as well as other community activities. After enjoying lunch amidst new friends, we have time to share with the people of Amaru, learning a little more about their customs and traditions. Before returning to our retreat center, we stop at the village of Pisaq, famous for its Andean market with its interesting food and artisan stalls. Try your bargaining skills here, always keeping in mind handmade artwork is worth it! Today we cross the Chinchero pampa (flat land), we take the turn to the town of Maras and the archaeological site of Moray. We begin our tour by visiting the ‘agricultural laboratory’ of Moray. This consists of circular concentric geological depressions, reinforced by agricultural terracing following the shape of these geological lines. There are considerable temperature differences between these levels, which facilitated the adaptation of plant species in different ecological levels, especially the adaptation of the important Sacred Leaf of Mama Kuka (erythroxylum coca). We leave this interesting archaeological site and continue to the town of Maras, which grew in importance in the 17th century because of the exploitation and commercialization of the salineras (saltpans). We will cross the extensive Maras Pampas, where people farm the land, and rear cattle and sheep. The Urubamba mountain range with its snow-capped peaks provides a spectacular background for our trek. In the town of Maras we will see the fronts of the ancient houses, made from finely worked stone, indicative of the economic heights achieved by the town’s population at that time. We may get the chance to meet an expert in the production of chicha de jora (juice of corn). We continue our walk through spectacular Quechua scenery, to arrive at the salineras of Maras (Maras Saltpans), whose bright white can be seen from a long way away. These salt mines have been exploited for centuries and continue to be used (recently, elegant bath products and table salt made from Maras Salt have been made available) and finish our walk descending to the Urubamba River bank to transfer back to retreat center. We leave the Sacred Valley very early in the morning as we have around 5 hours of travel today and take a scenic bus ride from 2900m.s.l over the Abra Malaga at 4320m.s.l. This is the literal high point of the trip. The route out of the Sacred Valley leads from near Ollantaytambo through a series of steep switchbacks to the Abra de Málaga , a pass which offers fine views of Mount Veronica. Scrubby forest - in the lower reaches - and fully-blown cloud and elfin forest higher up - supports a wide range of birds. From the pass, the road winds down and there is a great change in the vegetation and temperature as we arrive in the high jungle area near the town of Santa Maria. Late morning we stop at a small family-owned farm where we will enjoy lunch before touring the tea leaf processing facility. Our host explains the process of growing, harvesting, drying and preparing tea leaves. We are then formally introduced to the entire family and tour her organic farm and land. We sample different fruits, and are explained cacao farming and chocolate production. From here, we continue a further 1.5 hours along a narrow road that closely follows the Urubamba river to arrive at the town of Santa Theresa (1900 metres). Santa Theresa has been washed away by floods in 2010, 2008 and in the 1990’s which contributes to its haphazard makeshift feel. A short ride through the Santa Teresa Valley will bring us to the community of Lucmabamba and the start of an original Inca Trail. Walk 20 minutes to the home and artisan coffee farm of Enrique, a member of the COCLA cooperative. Although not in season, we will be able to walk through his farm as he explains about the coffee growing and harvesting process and season and shows us how the beans are dried and roasted. From here we continue to hike along the Inca Trail for approximately 3 to 4 hours to the ruins of Llactapata, a hidden gem that provides a different perspective on Machu Picchu. This hike takes us from an altitude of 1900metres to 2700 meters therefore is quite steep in a short period. We will enjoy a box lunch either on route or in the ruins before descending steeply 2.5 to 3 hours down to the Aobamba Valley floor and transferring to the Hydroelectric train station for our 45 minute train ride to Aguas Calientes. We wake up early and board a bus to Machu Picchu where we begin a complete guided tour of the Inca citadel that will take approximately 2-3 hours. You then have free time to walk around the site or choose to hike up the The Sun Gate (Intipunku) where the famous Inca Trail enters the reserve. Experience spectacular views of all of Machu Picchu, the valleys and mountains that surround it. In the afternoon, we meet in the town of Aguas Calientes, from where we take the train back to the city of Cusco, arriving after nightfall. This morning we visit the San Pedro market in Cusco. It is a vibrant spot in a very busy area in town that can keep you entertained for hours. Here you can have a first-hand look at how locals live day-to-day, outside the confines of Cusco’s tourist zones. By observing the scene you can hear the language as it is spoken and properly pronounced, view the gestures and habits that are common to the Andean culture, smell the scents of local produce and flora, absorb the styles and textures of the local fashion, see the fruits, vegetables and meats that make up the main staples of traditional meals, taste the local delicacies. 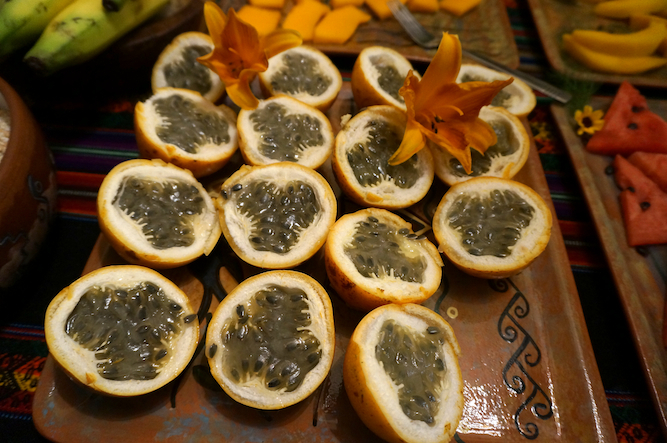 Before returning to the hotel, we visit the fascinating new "Museum of Sacred, Magical and Medicinal Plants", located in the old Inca Capital, Cusco. The nine halls of the Museum will take you in time and space to the ancient healing traditions, still alive in shamanic and folk healer’s traditions surviving in native culture of the Andes and Amazonia. The immense diversity of the South America flora and the vast indigenous knowledge of their properties will transport you to the realm of spiritual and corporal healing, the exploration of your own consciousness, where the interphase of natural, magical and spiritual dimensions meet. Free rest of the day to wander around the charming colonial streets of Cusco and maybe shop for souvenirs or the beautiful alpaca textiles found in several shops around the city. This evening we have planned a farewell dinner a Cusco. After breakfast, you are transferred to the airport for your flight to Lima. Upon arrival, we are driven to the district of Pueblo Libre to visit the Larco Herrera Museum. The Larco is housed in an exquisite 18th century colonial mansion, once again built atop a huaca. The museum holds the most extensive collection of pre-Columbian art in Peru, featuring many fine examples of textile work, one of which has a world record 398 threads per inch. After the visit, you may want to have lunch at the lovely Café del Museo, set amidst a gorgeous garden, before you evening transfer to the Lima airport to take our flight back home.